Today the National Portrait Gallery unveiled the official portraits of Barack and Michelle Obama. Amy Sherald, an acclaimed visual artist based in Baltimore, was selected to capture the former First Lady. Sherald's signature is painting her subjects in gray tones with colorful accents. Sherald won the Gallery's 2016 Outwin Boochever Portrait Competition. 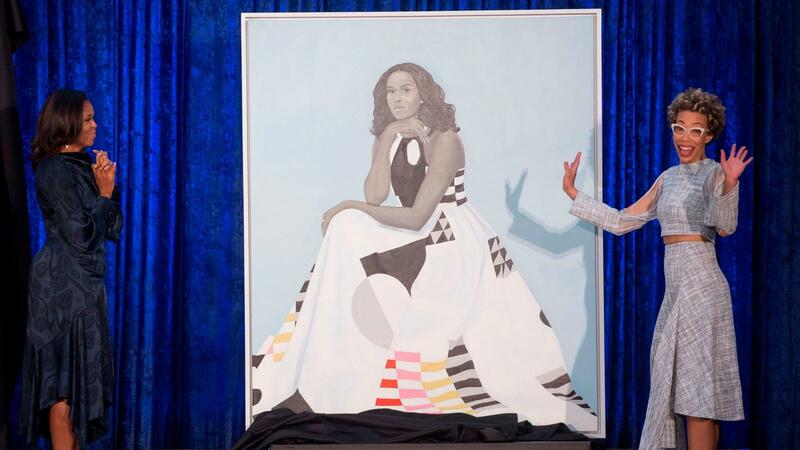 In her portrait, Mrs. Obama is posed wearing a Milly dress. Sherald said the dress reminds her of quilts you'd might find in rural Black communities throughout the south. At the portrait's unveiling, Mrs. Obama reflected on the importance of diverse representation in the celebrated museum. "I don't think there is anybody in my family who has ever had a portrait done, let alone a portrait that will be hanging in the National Gallery," she said. "But all those folks who helped me be here today, they are with us physically and they are with us in spirit." She continued, "I am thinking about all of the young people, particularly girls and girls of color, who in years ahead will come to this place, and they will look up and see someone who looks like them hanging on the walls of this great institution." The use of gray might be initially confusing, but Sherald chooses colors that cannot immediately be linked to race.